The Institute's technological positioning is closely linked to the scientific programme that guides the necessary instrumental developments and to the R&D programme in the Institute's fields of expertise. 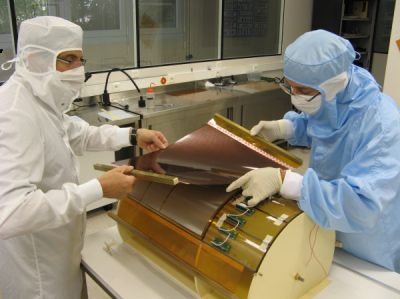 At Irfu, there are several platforms for the realization, integration, and testing of prototypes or series of detectors, to serve our various themes such as space, detectors, accelerators and cryomagnetism. The development and construction of space instruments is one of the strengths of the astrophysics department. For subatomic physics experiments, laboratories rely on platforms that allow them to develop R&D on detectors and microelectronics, but also to integrate them, test them and measure their performance. R&D focuses, for example, on improving the characteristics of Micromégas detectors: high flux resistance, picosecond time measurement, radiation resistance, neutron detection, high energy resolution. To meet these needs, the "MICROMEGAS FABLAB" has been developed. The Synergium is the large technology platform in the Accelerators, Cryogenics and Magnetism Department covering more than 25,000 m². It is intended for the national, European and international community, for research and development in the field of particle accelerators, cryogenic systems and superconducting magnets for the purposes of fundamental research.